Libby on the Label: #52 Ancestors - Week 9 "When There's a Will"
#52 Ancestors - Week 9 "When There's a Will"
It might be morbid but reading wills fascinates me. I've found a lot of great information by reading the details of old wills. I even read through the receipts people sign when they collect their inheritance. I love the old style handwriting. For this week's prompt "When There's a Will" I chose to post the will of my great, great grandfather Frances Button Marr. I found it in some of my grandmother's old files a while back. Years ago I put it on ancestry.com and it led to breaking through a brick wall. 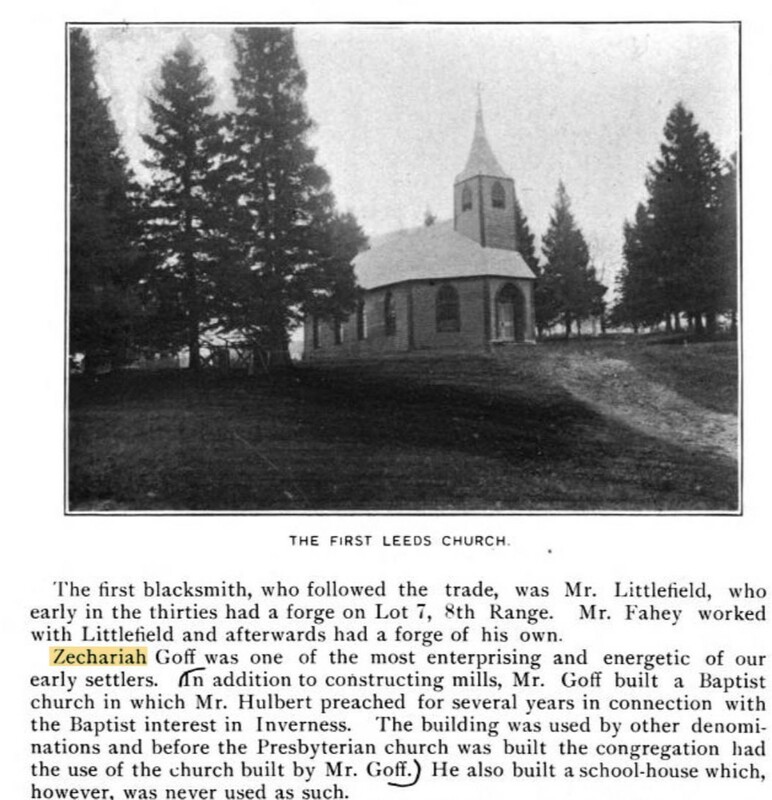 His wife, my great great grandmother, was Mary Ann Smith from Quebec. I had given up hope of ever know anything about her. My great great grandmother passed away April 18, 1907. The will was executed in 1910. Francis married his second wife Minnetta Sumner on September 1, 1907, five months after Mary Ann died. Minnetta was a clerk at the Post Office. She was single and living at the home of the Post Master and his family in the census of 1881, 1891 and 1901. Things sure did escalate quickly after Mary Ann passed away 😏 Francis Button Marr died February 19, 1915. Minetta never remarried and lived until the ripe old age of 88. There had been a mystery person who lived with Mary Ann and Francis. 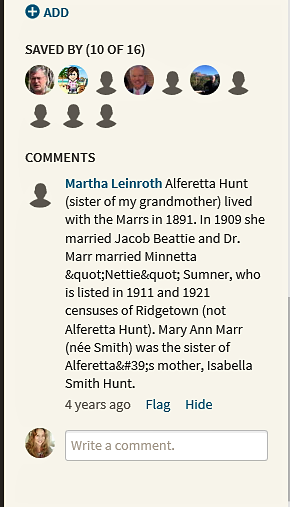 In their 1881 census there was an Etta Marr. She was 15 years old. I had never heard of her before. She was Irish and a Quaker. I knew for sure that Francis was a Methodist, so it seemed odd. Later, Etta Hunt appeared in the 1891 census. In his will that mystery was solved. 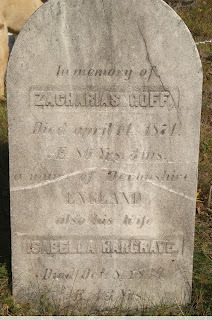 She was Alforetta Hunt, his niece. I had no clue who her parents were. I assumed that they were a Marr family because of the earlier census. I had taken a break from ancestry.com and rejoined in 2017. I see the this comment (photo →) next to Francis Button Marr's will. I posted it four years earlier. 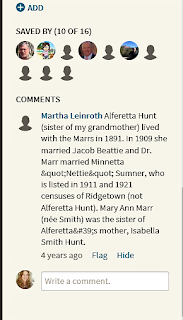 Isabella Smith Hunt was my Mary Ann's sister, and Etta Hunt was her daughter. She was a SMITH relative. I quickly reached out to Martha, who left the comment. Isabella Smith Hunt was her maternal great grandmother. Her grandmother Ada, Alforetta Hunt Beattie's sister, moved to the States after attending nursing school in Cincinnati. Reading the will helped Martha break through to her Canadian relatives. She did some excellent sleuthing in the four years that had passed. She discovered Isabella and Mary Ann's parents and three other siblings and their families. We're still stuck with the Smiths, though. William Smith (1819-1904), Isabella and Mary Ann's father, was from Ireland and emigrated to Quebec some time before 1838. That is when, at age 20, he married Jane Goff. Zacharias, Isabella and his third wife Mary Ann Cooke are buried in a small private cemetery on the Goff farm. There has always been a Goff descendant living there. I connected with the current owner. Her (soon to be ex) husband Donald is the Goff. He is a descendant of Arthur Wellington Goff, Zacharias' son with wife #3, Mary Ann Cooke. She is (amicably) keeping the farm when they divorce. I hope to visit one day. The Canadian portion of Zacharias' story began in Old Quebec City It's not too far away so maybe as part of a bigger road trip. She sent me some pictures of the grave markers, which was very nice. I never knew anything about ancestors in Quebec.If I hadn't posted my great great grandfather's will it's possible that I never would of learned of these people. Post everything, you never know. I have to credit cousin Martha for her detective work. DNA testing shows that we are 4th cousins. She and I are part of a larger DNA circle for Zacharias Goff and wife #2 Isabella Hargrave Goff. That circle could become huge one day if more of his descendants take the test!